First dog, Mochi, entered our life after two years of researching dogs. I found her on Petfinder listed as a maltese-poodle mix and put in an application for her based on the temperament description (no picture was posted yet). Perhaps she is..perhaps not; I find her looks and personality more like a Coton. Whatever her DNA may be, she is an awesome match and canine! Comments for Most likely a Coton! We had a dog as a kid named Mochi. 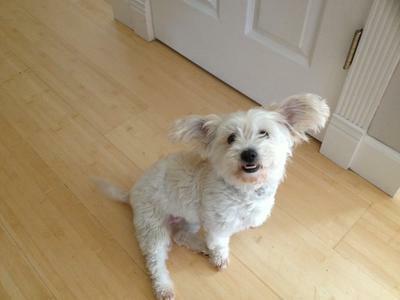 Yrs ago i was given a dog which was maltese/poodle mix. His name was Sach. He was a wonderful smart loving dog. People that see Jonah (Coton) & Sach cannot tell the diff. When Sach got older I looked in my Simon & Schuter dog breed book 2 look their were Cotons. At that time u really could not find them in US 1979. To make a long story short some 20 yrs later I found my Coton Jonah who I would still swear to this day that they were from the same soul. Since the Bichon family's make up were from Havense, Maltese, Poodle, Bolognese & I'm sure I've forgotten some all dogs r mixed 2 try & set a standard. Mochi is so beautiful her eyes her face she looks like a loving soul to b cherished. She is family here on this site as r u. So please keep the pictures & posts coming 2 share the fun of growing up Mochi and welcome. Sounds like you and Mochi are meant for each other. Love those ears and he does look like a Coton. That face! Whatever she is she is adorable! Looks like she could be but what really matters is if she is loved. Enjoy her and so glad you found each other.